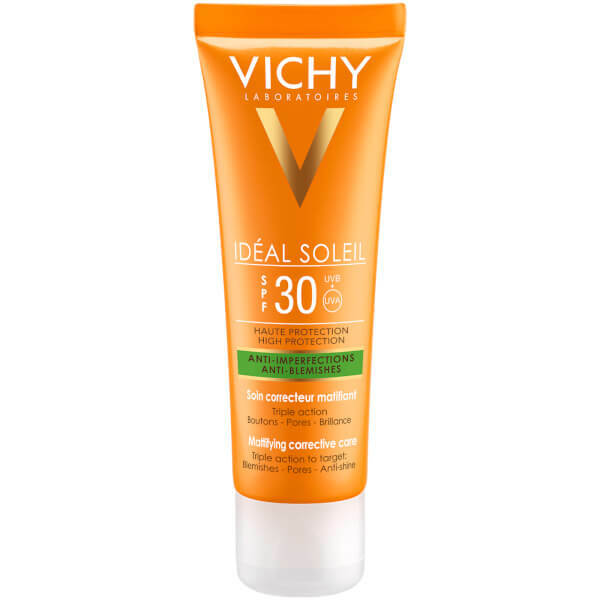 Care for skin with Vichy Ideal Soleil Anti-Blemish Corrective Care; a protective sun cream specially formulated for blemish prone skin. 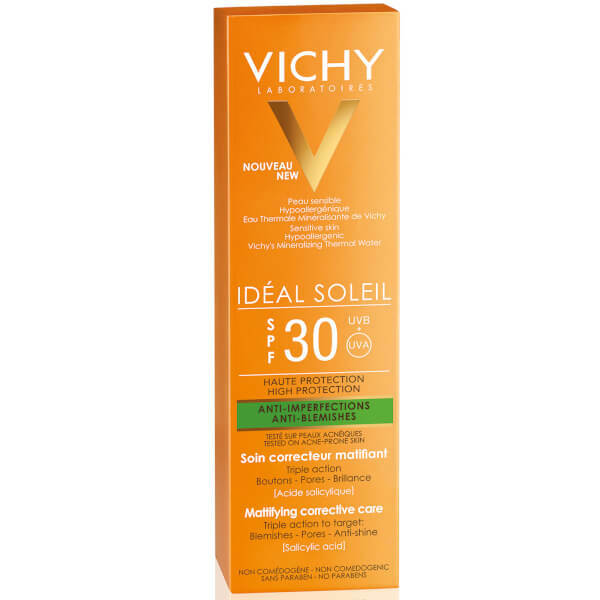 The SPF30 formula combines broad spectrum UVA and UVB filters with sensorial textures to ensure a gentle yet effective product that is suitable for all skin types, including sensitive skin. Fortified with a soothing dose of Vichy Mineralising Water, the corrective care cream delivers a veil of moisture to skin, which keeps the face hydrated and helps to shield skin from free radical damage caused when it is exposed to the sun. 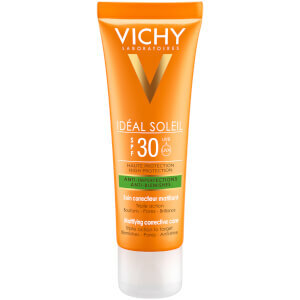 The protective sun care discourages UV induced blemishes and delivers a shine free finish. The lightweight texture effortlessly absorbs into skin, without leaving behind a greasy residue. Expect skin to be clear and well cared for during sun exposure. Non greasy textured designed for everyday use. Apply to the face, neck and decolletage. Apply just before exposure. Re-apply frequently and generously to maintain protection, especially after swimming, perspiring or towelling. Avoid the eye area. In case of contact with eyes, rinse immediately and thoroughly. Aqua/Water, Alcohol, Diisopropyl Sebacate, Octocrylene, Butyl Methoxydibenzoylmethane, Silica, Titanium Dioxide, C12-15 Alkyl Benzoate, Isopropy Llauroyl Sarcosinate, Zea Mays Starch/Corn Starch, Niacinamide, Ethy;Hexy; Triazone, Poly C10-30 Alkyl Acrylate, Triethanolamine, Glyceryl Stearate, Behenyl Alcohol , Methylene Bis-Benzotriazolyl Tetramethylbutyphenol [Nano]/Methylene Bis-Benzotriazolyl Tetramethylbutylphenol, Drometrizole Trisiloxane, Ammonium Polyacryloyldimethyl Taurate, Bis-Ethylhexyloxyphenol, Methoxyphenyl Triazine, Butylene Glycol, Capryloyl Salicyclic Acid, Caprylyl Glycol, Cetyl Alcohol, Cinnamomom Cassia Bark Extract, Disodium Edta, Disodium Ethylene Dicocamide Peg-15, Disulfate, Glycerin, Glyceryl Stearate Citrate, Myristyl Alcohol.